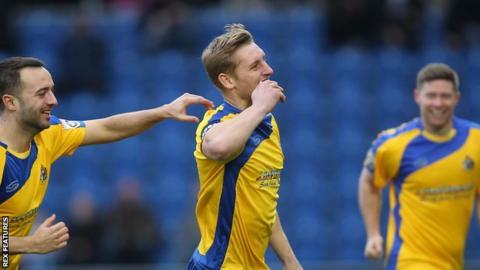 Altrincham moved out of the National League relegation zone with an impressive victory over Aldershot. Damien Reeves broke the deadlock by finishing via the crossbar from James Lawrie's cross before Josh Ginnelley doubled the lead after a 50-yard run. Jake Moult ended the game as a contest, converting a penalty after the lively Lawrie was fouled by Omar Beckles. And Jordan Sinnott completed the Shots' miserable afternoon, scoring after good work from Ginnelly. Aldershot Town boss Barry Smith told BBC Surrey: "We didn't defend properly and their front four caused us so many problems. "It was down to us not defending properly for the first goal. It comes from a centre-back not being dominate and we couldn't get a grip in the game. "We lost battles all over the park today. Once you cross that white line it is down to the players to make sure they are doing the jobs that they've been asked." Match ends, Altrincham 4, Aldershot Town 0. Second Half ends, Altrincham 4, Aldershot Town 0. Substitution, Aldershot Town. Rhys Browne replaces Giorgio Rasulo. Attempt missed. Jack Saville (Aldershot Town) header from a difficult angle on the left misses to the right. Substitution, Altrincham. Jimmy Phillips replaces Jordan Sinnott. Marcus Holness (Altrincham) wins a free kick. Attempt missed. Giorgio Rasulo (Aldershot Town) right footed shot from outside the box is too high from a direct free kick. Substitution, Aldershot Town. Jim Stevenson replaces Alfie Pavey. Goal! Altrincham 4, Aldershot Town 0. Jordan Sinnott (Altrincham) right footed shot from the right side of the box to the top left corner. Assisted by Josh Ginnelly with a cross. Offside, Altrincham. Jordan Sinnott tries a through ball, but Jordan Sinnott is caught offside. Offside, Altrincham. Josh Ginnelly tries a through ball, but Josh Ginnelly is caught offside. Goal! Altrincham 3, Aldershot Town 0. Jake Moult (Altrincham) converts the penalty with a right footed shot to the bottom left corner. Penalty conceded by Omar Beckles (Aldershot Town) after a foul in the penalty area. Penalty Altrincham. James Lawrie draws a foul in the penalty area. Foul by Tom Richards (Aldershot Town).